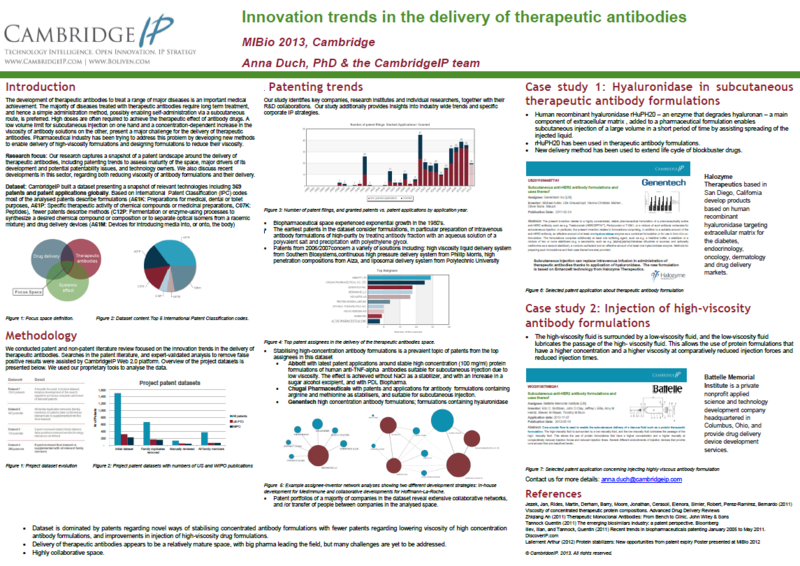 Anna Duch (Associate) presented a poster at MiBio 2013 on ‘Innovation trends in the delivery of therapeutic antibodies’. Using CambridgeIP’s advanced analytics capabilities she identified the patenting trends and owners of intellectual property covering major development areas in the field of delivery of therapeutic antibodies. The development of therapeutic antibodies to treat a range of major diseases is an important medical achievement. The majority of diseases treated with therapeutic antibodies require long term treatment, and hence a simple administration method, possibly enabling self-administration via a subcutaneous route, is preferred. High doses are often required to achieve the therapeutic effect of antibody drugs. A low volume limit for subcutaneous injection on one hand and a concentration-dependent increase in the viscosity of antibody solutions on the other, present a major challenge for the delivery of therapeutic antibodies. Pharmaceutical industry has been trying to address this problem by developing new methods to enable delivery of high-viscosity formulations and designing formulations to reduce their viscosity. CambridgeIP conducted patent and non-patent literature review focused on the innovation trends in the delivery of therapeutic antibodies. Comprehensive searches in the patent literature, and expert-validated analysis to remove false positive results were assisted by CambridgeIP Web 2.0 platform.